The 12-around-1 framework is fundamental as it is found in the cosmometry of both the Vector Equilibrium and Icosahedron – two of the primary geometric configurations of the cosmos. In essence, the concept of a 12-around-1 whole-system model of the basic areas of human concern has the intention of providing an organizing framework that can assure that, as we apply ourselves to the design and application of solutions to our worldly challenges, we do so with a minimum-sufficient set of considerations at the outset and throughout the whole process. Each sector can be seen as a fractal "whole" unto itself, and yet each one is always in relationship to the others and the dynamics of the whole as it evolves over time. This particular model originates from the pioneering insights of Barbara Marx Hubbard, Jan Ballard and others back in the 70's and has itself evolved to this current sector configuration over decades of thoughtful consideration by various teams of people dedicated to whole-system pursuits. It is featured in the THRIVE film and website and is also used (or variations of it) by numerous organizations, including the Foundation for Conscious Evolution, Transpartisan Alliance and the The Shift Network. The 12 sector names represent the most generalized, broad-strokes primary categories of human concern. Each one can of course be expanded into a vast array of sub-categories pertinent to their respective domains (some of which may even apply across multiple sectors). 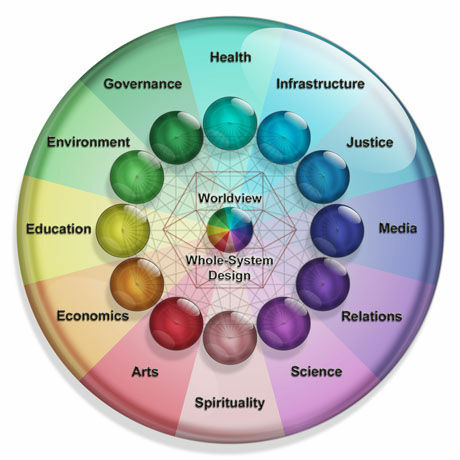 At the center is Worldview which is a synthesis of all the sectors in a synergetic whole that informs the perceptions and agreements that participants use to collaborate in whole-system design and problem-solving processes. In the version below, Whole System Design is also included in the center to represent the aspect of applying this model that is specifically oriented to discerning and attending to the dynamics and interrelatedness of the sectors when combined as a whole.